As the stories have come out and are coming out about Harvey Weinstein and more and more women are speaking out, I’ve spent a lot of my time feeling sick, with feelings of nerves and anxiety. I haven’t quite been able to work out why – I felt like I was over-identifying with the victims – I’ve never met Harvey Weinstein of course, and I’m unlikely ever to meet him. It’s taken a few days to admit to myself that I’ve met men like him my whole life, have learnt to deal/not deal with them, ignore them, laugh along, keep out of their way, or endured them. I can’t remember exactly how old I was when I was first groped. I only know it was on a minibus and that it was an older boy who rubbed the side of my breast by sticking his arm between my seat and the window. A group of them had teased me the whole journey — it was a camping trip and a long drive — and I’d played along. I’m good at playing along: good at mimicking the register of the banter, always quick with a comeback, able to suss out someone’s personality fast and get their mates laughing. Maybe you are, too. As I got off the bus, our chaperone asked if I was okay and I said yes, carsick, a little, and avoided the boy all weekend. It was the first of many times I was an imperfect victim. The concept of the imperfect victim is probably one that many women can identify with. Throughout the course of my PhD, I’ve been looking back and examining my own life for experiences of sexism, but maybe a better way of describing them would be experiences of being the ‘imperfect victim’, and experiences of men who are ‘imperfect perpetrators’. Men who are friends and continue to be so afterwards. Men who are colleagues and continue to be so afterwards. Men who are tutors, but just be sure to avoid them if they’ve had a drink. One of the many reasons it can be difficult for women to speak out is our own ideas of what the p perfect victim is (dressed modestly, not drunk, not walking home late at night alone) and how we match up to it, but also of what the ‘perfect’ perpetrator should be like (a stranger, violent, and only extreme assault ‘counting’). Over the next couple of days, I’ll be posting some poems around this theme. The following poem is from a sequence I’m working on called ‘All The Men I Never Married’. One of the men in this poem, one of the boys that this poem concerns sent me a Facebook friend request years later. I accepted. The act of doing this stirred up that near miss, that thing that almost but didn’t quite happen. I wrote the poem. Afterwards, I unfriended him without explanation. The act of writing the poem helped me to realise what happened, what didn’t happen. The idea of the ‘imperfect victim’ (drunk, at a party, wearing a skirt, going upstairs at a party, being alone, being alone with men, talking to men, being friends with a man) runs through this poem, as do ideas around imperfect perpetrators (a friend, a best friend, just having a laugh, boys will be boys, drunk). What happens afterwards? After the near/almost/notquite incident? Or after the poem? What do women carry with them? What did I/do I carry with me? Writing about these incidents might be a way of finding out. This poem is full of air, and space, and silence, and things not said, not thought. What happens to conceptions of assault and what it is when I put a poem around it? I’ve not been to one school christmas concert this year. I’ve not played one christmas carol, or conducted a christmas carol. This is my first end-of-term where I am not a music teacher. It obviously feels very different – this year, my end-of-term has come to an undramatic end, quietly fizzing out on its own. Last week at university, only a few students showed up for their last class of the year – and it was a very quiet, relaxed session. The end-of-term I’m used to consists of last-minute rehearsals for performances and crisis management as instruments fall apart, children don’t turn up or they turn up but forget their instruments. End of term as a music teacher felt like life speeding up to twice the speed it normally goes while everybody else was slowing down and watching Disney to pass the afternoons. This year has obviously been different. When I look back at the madness that used to be my end of term, I do feel a wave of nostalgia, maybe even longing, but only for a moment or two, thank goodness. This week I’ve been working a lot on my RD1 form – although I have nothing to show for it, as it has mainly consisted of reading. I’ve been reading ‘Feminism and Poetry’ by Jan Montefiore. There is a really interesting but quite complicated section on Imaginary Identity and the psychoanalyst Jacques Lacan. Jan Montefiore writes ‘in traditional love poems in which a masculine poet idealises a figure (generally though not invariably that of a woman’ into a mirroring muse who reflects back to him his own ideal image. This is a narcissistic form of representation, which denies true identity to its object in ways closely responding to those analysed by the French psychoanalyist Luce Irigaray as characteristic of masculine discourse in general’. I’m currently writing a series of poems which I’ve called ‘All the Men I Never Married’. Every poem has a man that I’ve encountered in some way – some are ex-boyfriends, some are friends, some are strangers. I keep thinking about this idea of a woman being used to reflect back an image, and wondering how this translates in the poetry that I’m writing. If I am looking back at my life or memory, or looking out at the world through the prism of men, is this a feminist thing to do? Is that what I’m doing? I don’t think I’m using men as a mirror to reflect back my own ‘ideal image.’ But maybe I’m using them as a microscope, or a telescope, or maybe even a map, to find my way around the self. Maybe that is as bad as using them as a mirror! If I wrote a poem with a man as a mirror, what would it look like? Maybe I should try. Except I need to get on with the RD1 form, so I will have to put this line of thought on hold for a moment, but I think I can insert Lacan and Montefiore and Irigaray into my RD1, which might be the theory that I need to hold the whole precarious thing upright. This week has been very varied – there is a wonderful, tiny hall down the road from me – the Ormsgill and Hawcoat Memorial Hall, which is owned by the ‘village’ of Hawcoat. I’ve always wondered what it was like inside, and my husband has managed to track down the key holder, and I went to see it this week. I’ve decided to hire it for my 2017 Barrow Poetry Workshops. It has its own kitchen and I can walk to it from my house, which is very convenient. I also went to see Pauline Yarwood this week and we spent a long time working on the Arts Council grant to put on another Kendal Poetry Festival in 2017. I’m sure filling in the Arts Council application form is like giving birth. I can’t remember it being this painful last year, but it must have been. Did the birth of the festival erase all the memory of drudgery and despair from my mind? It must have done. After I finished teaching at university this week, I drove to Todmorden to take part in the last ever Kava. This is a series of readings and lectures run by the ever-energetic and enthusiastic Anthony Costello. The format of the evening is a lecture by a poet on anything to do with poetry and then a poetry reading by another poet. I read at Kava a while ago and had such a bad cough and cold that my friend Keith Hutson had to jump up and speak for me. I was relieved that I was in better shape this time round. The scary (and wonderful) thing about giving the lecture at Kava is that Anthony prints it out in a little booklet. This means that the lecture requires much more careful thought than if you were merely reading it out without any written evidence. I really enjoyed the event – it was lovely to see so many people who I count as friends. I think this particular area of Yorkshire is brimming over with poetry talent. I’d also like to thank Anthony if he is reading this – he has done a brilliant job putting these events on – I know how hard it is to organise events, and what a thankless task it is sometimes. Having said I really enjoyed the event, it also gave me a lot to think about and puzzle over. After telling the audience I was going to talk about my PhD topic, which is writing poetry about everyday sexism, I hadn’t got to the bottom of the page before a man interrupted to tell me that he didn’t think sexism or racism existed. Anthony handled this really well, and asked the man to wait for questions at the end – so I continued onwards. When he raised his hand to make this point again, I responded by saying that I thought it was important to have names for things that happen that the act of naming is really important. One thing I noticed in the break was that lots of men came up to tell me their own experiences of sexism. At the time it just felt like a series of fairly normal conversations. The next morning I woke up feeling – a bit stunned is probably the best description. I felt annoyed by the ‘sexism doesn’t exist’ man, but at least I knew why with that. There was also something funny about being interrupted by a man, when I’d been asked to give a lecture. Annoying, but yes, I can see the funny, slightly ridiculous side as well. But I also felt unsettled by the amount of men who had come to tell me about their experiences of sexism – and this was harder to reconcile, and is harder to reconcile because some of the men who told me about their experiences of sexism are my friends, and I love them dearly. Why did I wake up feeling unsettled? I’m still not completely clear, but I think it has something to do with how we listen to others. If a woman talks about oppression that happens on an everyday and continual basis, and the first thing you say in response to this is that sexism doesn’t exist, that is a blatant attempt to silence, to sabotage. If a woman talks about oppression that happens on an everyday and continual basis, and the first thing you say in response to this is to recount your own singular experience of sexism, which happened about forty years ago, that is not silencing, or sabotaging. But it isn’t listening either. Maybe it is more like muting. Having said that, I genuinely believe the men who talked to me about their experiences of sexism were trying to reach out, to connect, to empathise or sympathise. Maybe there is no perfect reaction when we are talking about oppression and discrimination. But imagine how strange it would be if a person who was black or ethnic minority talked about their experiences of racism, and then I went up to them to tell them about my own random and singular experience of racism as a white person. In fact, even as I write this, I realise I’ve done a version of this! My friend was telling me about homophobia that he experienced, and I told him about going into a gay club with a friend, and hearing the bouncer refer to me disparagingly as a ‘breeder’. Now, why did I do that? My intention was good – I think I wanted to tell him I understood discrimination on the grounds of your sexual preference. But here’s the thing as I see it now, thinking back. I didn’t understand discrimination on the grounds of sexual preference, because it was something I have experienced only once, in that moment. It was something I could walk away from. It happened when I was about 18 – I’ve remembered it all these years so it obviously had an impact – I remember thinking how unfair it was, and how shocked I was by it. But I couldn’t claim to experience it in the same way that my friend had experienced it for most of his life. Thinking about this gives me a little bit more of an insight into the motivations of the men who came up to tell me their own stories. And it’s taken me to the age of 36, and writing this blog, to puzzle out why I shouldn’t have slapped my story of discrimination on the grounds of sexual preference right on top of my friend’s story about the many forms of homophobia he had experienced. It was so long ago, I can’t even remember which friend it was now, which is a shame, because I’d like to apologise. Anyway, I hope that all of this doesn’t sound like I didn’t enjoy Kava because I did. I really enjoyed it, and the chance to see lots of my friends that I haven’t seen for a while. The whole night, as you’ve just read has made me question my own assumptions and prejudices and thinking. It’s made me realise that the PhD is going to be challenging and exciting and difficult and frightening. Which is probably a good heads up at this point. I started the lecture at Kava by saying my thoughts on the whole subject are still very new, and evolving. As part of the lecture, I included one of Helen Mort’s poems ‘Difficult Women’. I heard Helen read this poem at the 2016 Kendal Poetry Festival, and I loved it then. I included it in the lecture as an example of the problematic way that women are talked about. I love the way that the poem mixes up the factual language about other things and inserts the word ‘woman’ in there like the line ‘If a difficult woman hits you at 30 miles per hour/you have a 50 percent chance of survival.’ I’m guessing the word ‘woman’ should really be the word ‘car’. And later on, in stanza 2 ‘In London it’s said that you’re never more than 6 feet/from a difficult woman.’ I think that is usually said about rats. I’ve already told Helen that I think she should have some ‘I am a difficult woman’ t-shirts made. I’d definitely wear one. The sad thing about this poem of course, is that the women in it are not really being difficult at all. The voice of the poem makes out they are being difficult – ‘crowding’ the bus stop, ‘refusing to budge’ or worse ‘driving cars’. But the reality that the voice tries to create is only a version of reality. In truth – the Difficult Women in the poem are just living. They are waiting for the bus stop, they are walking, running, cycling or driving cars. They are pictured in newspapers, or serving coffee. They are moving into your road – pretty normal things really. Maybe the poem is also commenting on the difficulty of defining women – the women portrayed in the poem are very different versions of what it means to be a woman. The end of the poem is also very unsettling. Who is the poem addressing, and who is the voice of the poem? Is it an ironic, cool voice of a woman addressing women – the last line leads me to think so. Although the last line doesn’t say ‘Are you afraid you may be a difficult woman yourself?’ It says ‘Are you afraid you may be difficult yourself?’. Does this imply that men can also be difficult, that being difficult is a state to aspire to? I’m left with that feeling- that it would be a compliment to be difficult. Or the speaker of the poem could be a man, the type of man who wrote the article on AskMen.com in the first place. 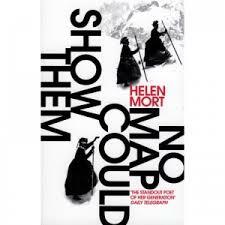 Most of you will already know Helen’s work, I’m sure, but just in case you don’t, the poem comes from her latest collection No Map Could Show Them published by Chatto in 2016. Helen was born in Sheffield and her first collection Division Street was shortlisted for the Costa Prize and the T.S. Eliot Prize. In 2014 she won the Fenton Aldeburgh Prize. She writes an interesting and thought-provoking blog called Freefall. She also has her own website where you can find more information about Helen. I think this is a fantastic poem – it has layers and layers that I’m sure I’ve only begun to unpick. It has haunted me since I first heard Helen read it, so I’m really pleased that she has allowed me to feature it on the blog this week, and to let me use it in the lecture at Kava.